Just a Little Ink: And finally, a post! It's been a long week. I've wanted to post pictures I took of cards I've made as well as some that I have received in swaps. The week ended up bringing me some sinus headaches, and I'm just now feeling up to posting. Unfortunately, these cards all use products from the Occasions Mini Catalog that just finished the end of April. 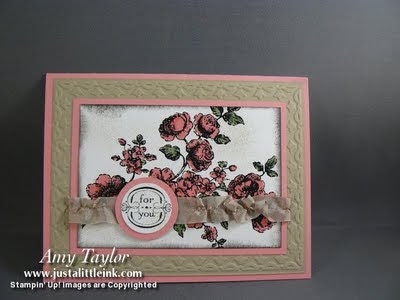 However, you could use other papers, stamps, etc to make the card layouts. And, if you just happen to be someone who purchased the items used, it will give you some new projects to try! This first card is one that I made for a demonstrator swap back in March. The layout is one that Stampin' Up! shared with demonstrators in our monthly magazine. I used the Designer Series paper Sweet Stitches, and the Embosslit folder Sweet Buttons, as well as the Teeny Tiny Wishes stamp set (great all around saying set), and Tiny Tags stamp set to make the card. 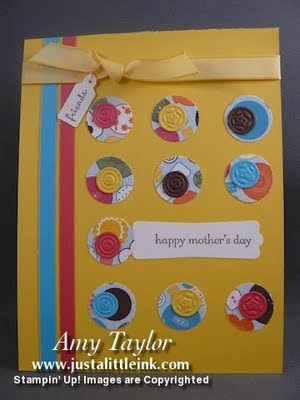 I also used the 3/4" Circle punch, Modern Label punch, Jewelry Tag punch and Daffodil Delight Taffeta ribbon. The card stock colors are Daffodil Delight, Tempting Turquoise, Melon Mambo, and Whisper White. 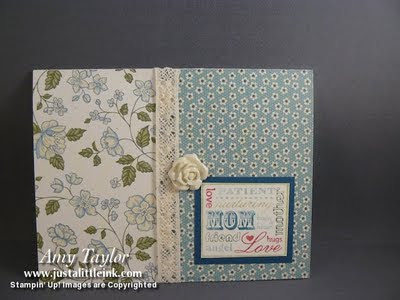 Here's another card I made using the Springtime Vintage Designer Series Paper, Mother of Mine stamp, and Vintage Flower Adornments from the Occasions Mini catalog as well as Chantilly 1/2" crochet trim from the 2010-2011 Idea Book & Catalog. This card was made by my friend Kathy Howes . Adorable isn't it, using the Framed Tulips Textured Impressions folder from the Occasions Mini, and the Elements of Style stamp set (#118611 in wood or #120045 in clear) from the 2010-2011 Idea Book & Catalog. Please stop back by. I'll do my best to post a few more cards tomorrow. I have probably 20 to post! Lovely cards you have made! I try to find a model - the graduate cap - but I did not find it here in your blog - have you got a tutorial .....?